Incredibly good food and experience. Waitress was perfect. Food was really good. We had a variety of items and they were all good. We will come back with no issue. 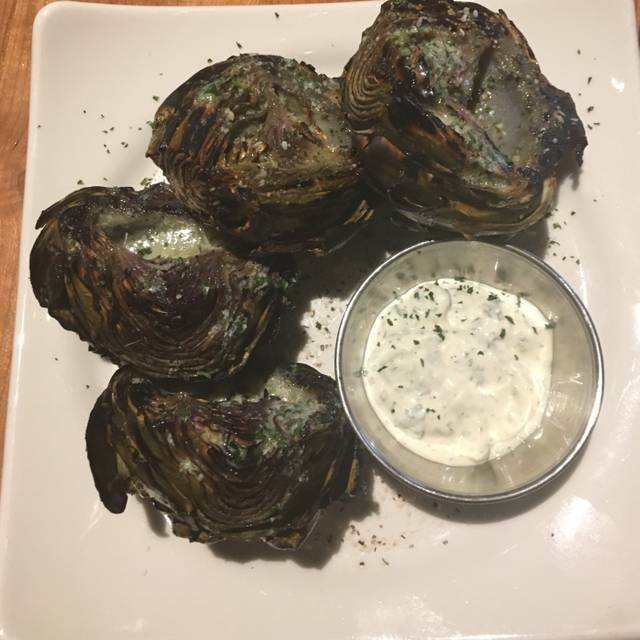 This was our second dinner at J Alexanders, this time, a party of 4, and can say that the food was consistently very good. One person had prime rib - excellent; 2 had cod special, also very good as was the crab cakes, with lots of lump crab. The spinach queso appetizer is addictive. Service was friendly but a bit disjointed - forgetting silverware after cleaning table of first course and waiting for it when entrees were served. Also ordered a glass of wine when entrees were delivered and by the time it came, I was nearly finished. They apologized for delay and comped the appetizers which was nice. Overall good experience and would definitely go back. 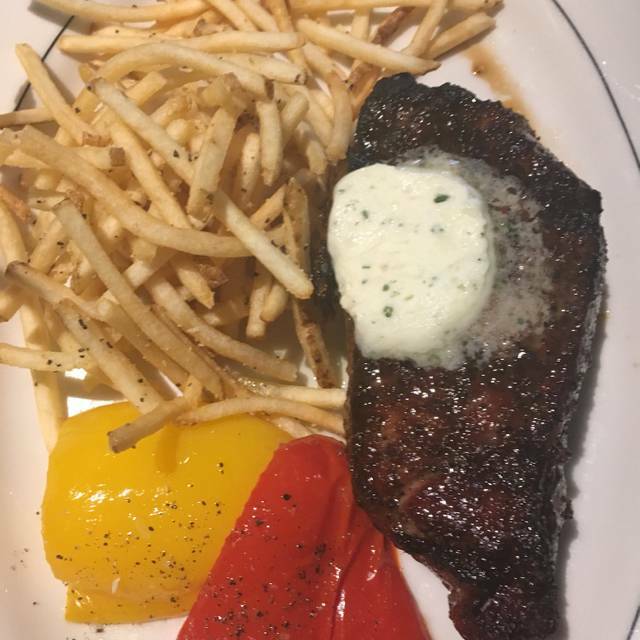 Food and service is very good and price is much more reasonable than other steak houses nearby. Wish you would offer chicken tenders as an appetizer and offer a sweet & spicy chili dipping sauce. Love the chicken tenders, deviled eggs, maui steak, key lime pie, coffee, espresso, husband loved the salmon. Friends love Hawaiian sushi, fries, barbecue sauce, chicken tenders, ribs, mac & cheese. Everyone loves your cocktails ! Very friendly & attentive wait staff. You could use thicker shades to block out setting sun, and room could use a bit more light for us old folks. Our first visit here was outstanding and we couldn't wait to come back. This visit started off on the wrong foot from the second the server came to our table. He had a chip on his shoulder and displayed attitude the entire time we were there like we were an annoyance to him. I hope this was an "off" day for him; however, considering the type of establishment he works at, I would expect better. The food was great though. DO NOT EVER STOP SERVING THE HONEY BUTTER CROISSANTS!!!!! 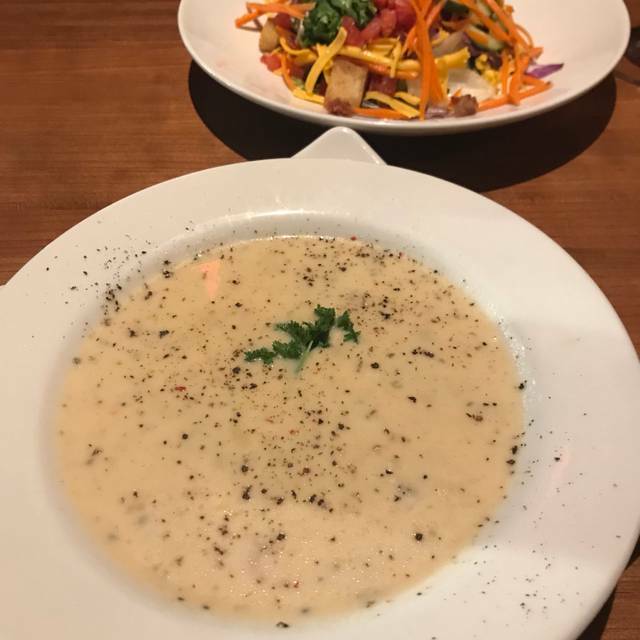 The rest of the J Alexander’s restaurants should bring them back! The food was excellent - the service is 2nd to none - our very favorite restaurant in the area!! I LOVE J Alexander’s I really do but this is now the 3rd time we’ve had an issue. We ordered appetizers and entrees. We waited 45 min and everything came out at the same time. We had to send the entrees back and I’m sure they just reheated them. The server was great but I don’t know why this keeps happening (apps and entrees at same time). This is the perfect date night. My husband and I love going to this place and the food is amazing. 2 thumbs up!!! 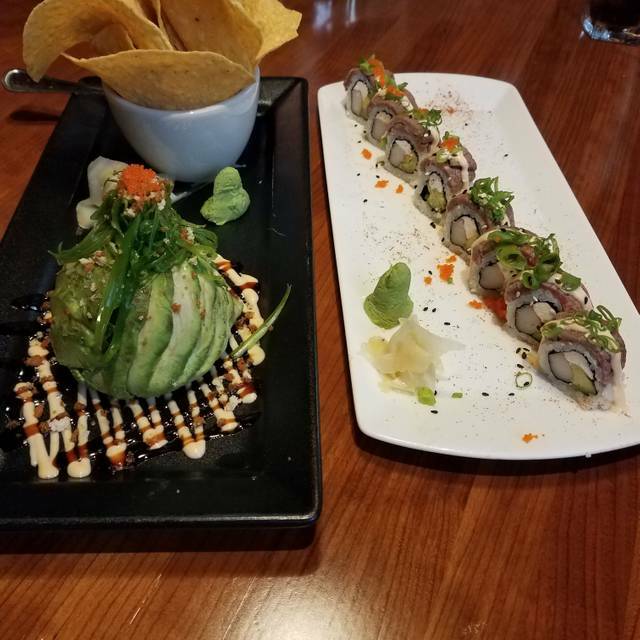 Delicious food and great service. The ice cream sundae is actually totally worth it! I was disappointed in both the food and the service. It truly felt like a chain restaurant. Service was rushed and it felt like the waitress just wanted us out of there. The food was avg. my gf had a steak that was overdone. My ribs and sauce were just ok and over cooked as well. Overall disappointing meal after hearing good things about the place. Impressed by the food and atmosphere! Great service and great value! Overall the food was pretty good. I got the Spicy Hawaiian roll and bok choy. My complaint was the roll wasn't spicy at all, but was still good. 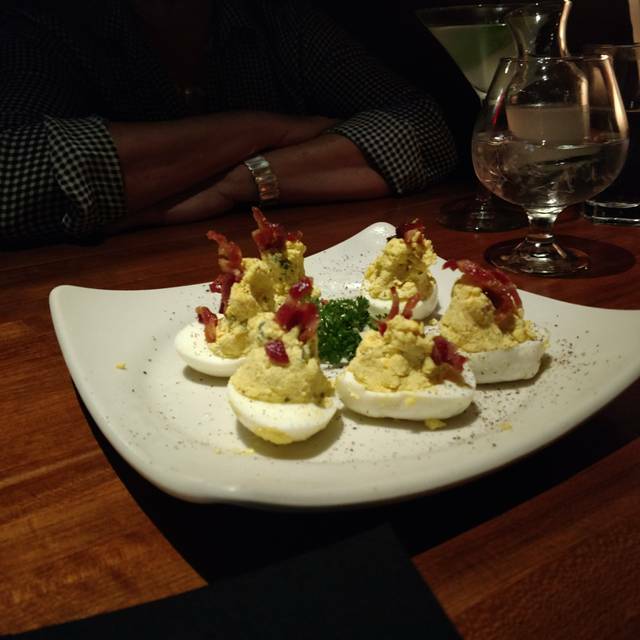 We also got the deviled eggs as an appetizer and those were delicious. I ordered the drink with bulleit rye, blueberry, and ginger beer and the manhattan that was on the drink menu. Both were really good. The service was awesome. Very personable staff. Service was exceptional! Tyler, Trevor and Emily always stay on top of things! Food was great and the entire experience is always pleasurable! My second time here. This was a girlfriend celebration of my birthday and it was a great time! Started at the bar with exceptional martinis and a manhattan. Love how the extra martini is automatically given. Drinks were strong and well made. The servers/bartenders are all dressed so well with their hair up - love that! Our server was Tyler and he was really fabulous! Attentive, fun, engaging, and exact with our food and drink orders. The food was wonderful! This time had filet medallions which were cooked perfectly! Friend had ribs which were melting off the bone and the sauce was perfect! Before I had crab cakes which were literally all big chunks of delicious crab! 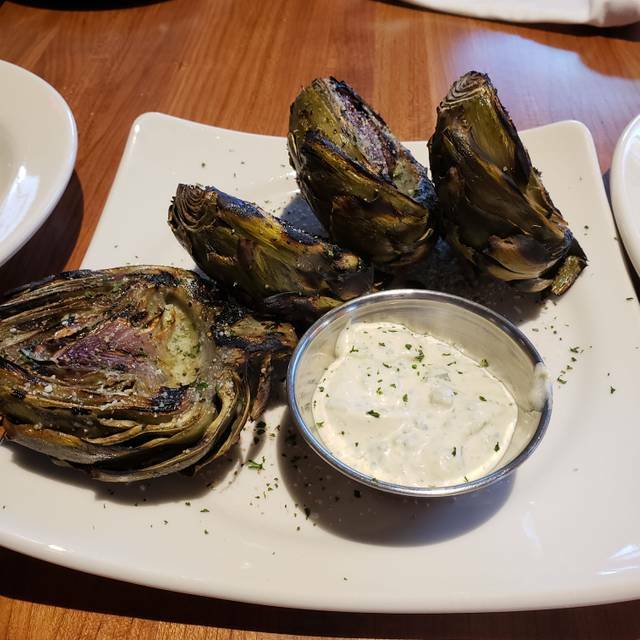 Have had deviled eggs, grilled artichoke and calamari as apps. All delicious! Desserts - carrot cake was warm and huge! Key lime was perfect. But that chocolate cake (with a candle in it for my birthday) was just decadent! All around, I love this spot! Makes me feel like I’m in the City (only with lots of parking!) because of the diverse crowd and the ambience. Recommend highly for those who don’t want to drive into the City but want a top notch evening out! Good job J. Alexanders! Another great meal at J. Alexanders. The Deviled eggs are the best!! Tyler was phenomenal! Always pleasant and knowledgeable! Food was delicious and very enjoyable! Thank you to the entire team for always making our visit a great one! 2nd visit to the restaurant and more impressed with the venue this time. Great service from Claudia, good food and reasonable prices. Nice selection, interesting drinks and great service. Can't wait to go back. Service was great. Staff very accommodating. Very nice experience will definitely be back. Good day and thank you! 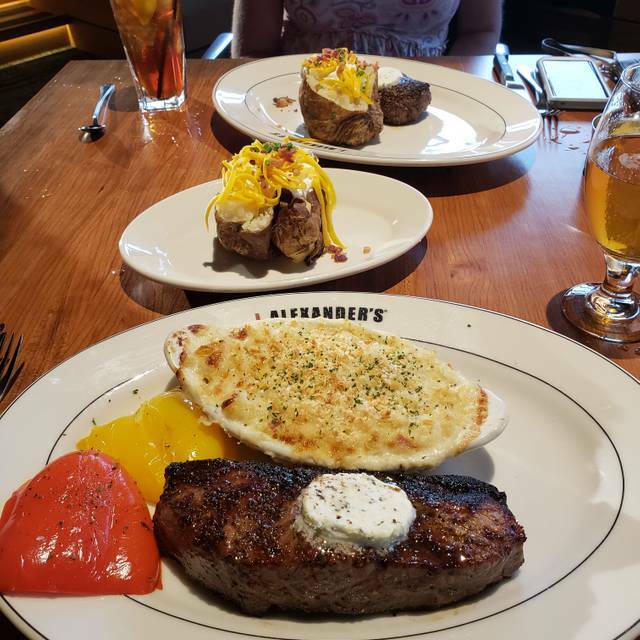 This was my 2nd experience at J. Alexander and both times exceeded my expectations. On this visit my brother and i arrived an hour early than scheduled. The hostess happily accommodated us and immediately found us a table. This was my brother's 1st experience and he is already planning our next vist. I am well pleased with J Alexander's and will return in the near. This was my first day visiting the establishment. The service was beyond amazing. I will definitely be back very soon. Good menu with reasonable prices. The sandwiches are very good and the service is always excellent. The servers are friendly and efficient. We always enjoy are food here and will return. The food was delicious and our waitress was wonderful! We were surprised that you did not carry a few more popular domestic beer and cidars. Bur the food was very good and portions were good. Service was outstanding. We love going to this restaurant on Friday Nights. Food is always good and there is a very diverse menu with daily specials. Cocktails are well made. Servers are very attentive. The Manager Emily always stops by to check on everything which is appreciated. 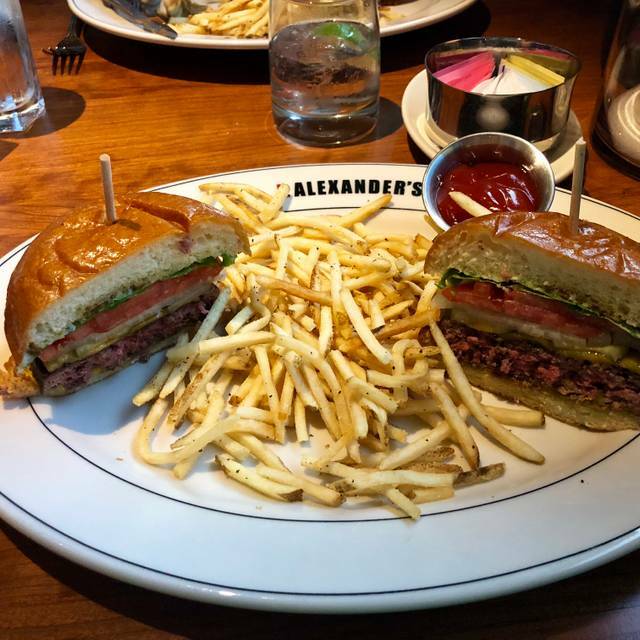 WE Love J Alexanders, the food is delicious and the cost is very reasonable. The service is exceptional and has been every time we have been there. Took my husband here for a birthday celebration and was very impressed with the service. The food was tasty and well presented. The prices were higher end but less expensive than the local steak houses. The price for a draft beer however was a bit over the top ($8). Overall a good experience and we will be returning in the near future. While the food was quite good, the service and food preparation was terribly slow (without apology or explanation). We ordered simple items to prepare: soup, steak, house salad, and baked potatoes—the food arrived after a long delay (without apology or explanation). Wonderful. We came in for the Sunday prime rib special. My husband decided to order a large cut. The kitchen sent out the special size. After speaking to our server, the hostess brought out an additional piece of roast beef. Everyone was so attentive and now we are sharing our leftovers tonite! I would definitely recommend J. Alexander's Restaurant to all of my friends. I truly enjoyed my dining experience and the food was well as the service was excellent. 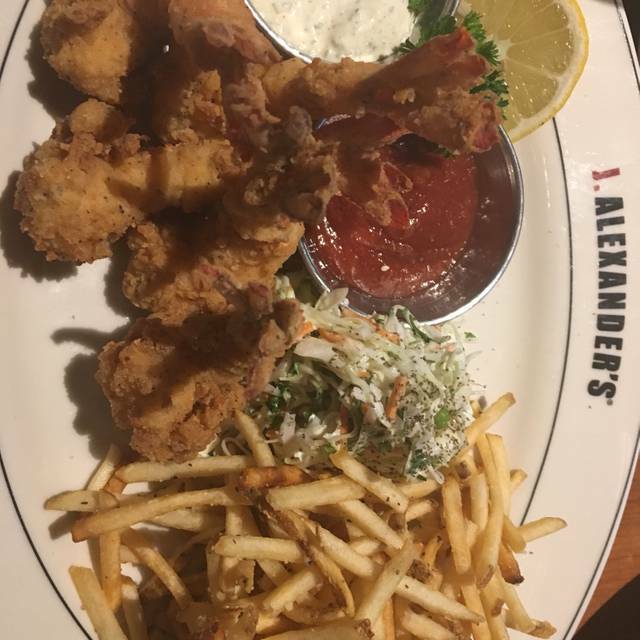 I plan on returning to J. Alexander's Restaurant in the very near future! Our service was not what we would expect. We had wonderful service and excellent food from our appetizer to our meals. Great place to go! !